In my previous installment, I argued that one could look at the re-release of Netrunner by Fantasy Flight Games and compare it to the original Wizards of the Coast version, released sixteen years ago, in order to take a zeitgeist measurement of the social and technological milieu’s that spawned each iteration. While last time I tackled the Runner, this time I want to examine the Corporation which, I feel, has far more indicative signs of change than could be found on the opposite side of the two-player equation. 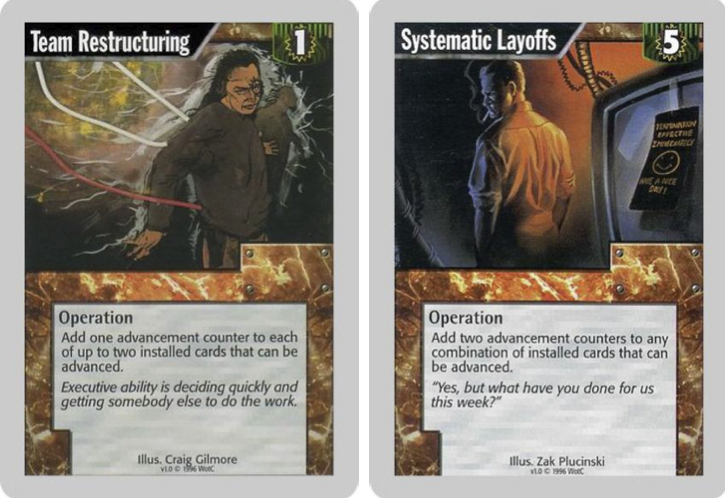 One of the first things I noticed when looking over the original, 1996 Netrunner Corp cards was how focused the set was on depicting human labor. Two of my favorites that demonstrate this focus on ‘humanness’ is ‘Team Restructuring’ and ‘Systematic Layoffs’. Both of these cards would seem to be pulled straight out of Corporate policies that were quite rampant in the mid-90’s, a period where new technology was quickly displacing traditional jobs held in corporate offices for decades previous. Each ‘operation’ gives the Corp player access to advancement tokens, which are required to score the victory point earning ‘agendas’, but the logic behind each action clearly links the shuffling of human labor in order to maximize efficiency and production. 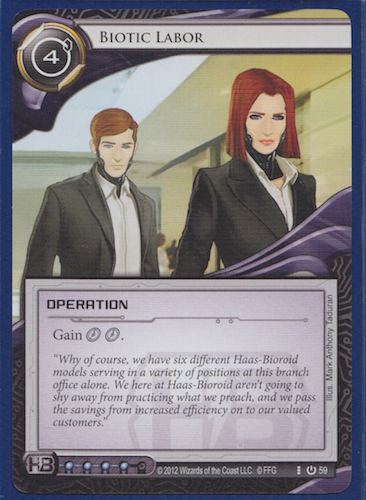 Compare this attitude to the Corp cards in the new Android: Netrunner set, which predominantly favor biotic, or cyborg labor. In 1996, the technology landscape was far less defined even as it contained some of the same players still in the game in 2013. There was definitely Microsoft- but no one really knew what direction they were going to take in the face of growing pressure to adapt to the fast emerging ‘Internet’. Yet in 2013, it would be silly to talk about the Internet and not mention a company like Facebook. The designers of Android: Netrunner clearly picked up on this perception of the corporate structure in our daily lives and decided the Corp players in the game would be better suited if they contained their own highly differentiated identities. Finally, (although this is only scratching the surface here), there is the issue of contemporary references that mark any game as a product of its unique temporal setting. 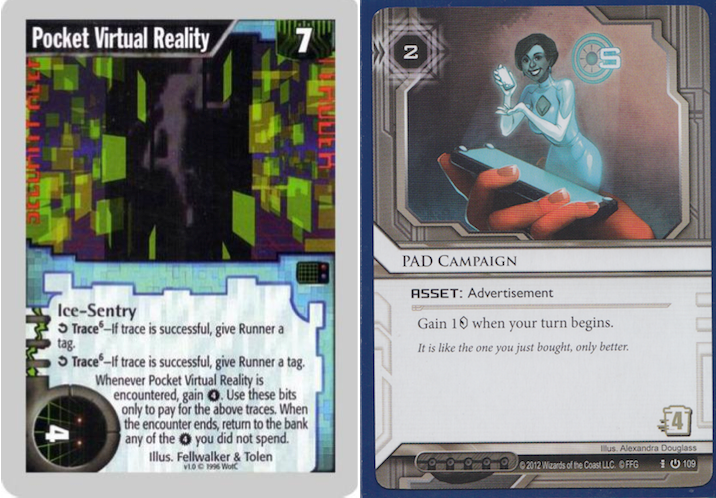 In the original Netrunner, nothing embodied that more than the card ‘Pocket Virtual Reality’. Except for the occasional op-ed piece that attempts to make a distinction between online and offline ‘reality’, one never really sees the term virtual reality anymore. This Ngram demonstrates that the term peaked in 1998, and has been in a steady decline since. Android: Netrunner follows similar suit with its card ‘PAD Campaign’, a clear reference to Apple’s very popular consumer device- the iPad. Now this might appear to be an obvious point to make, but my goal here to analyze the different card sets to see what marks each as a unique product of its time- and these two examples are definite temporal markers that cannot be ignored. What makes the two Netrunner games perfect for this kind of comparative analysis is that both utilize almost exactly the same rule set. Whereas many other ludic iterations on a similar theme seek to change the rules in order to provide a different experience for the player, the relatively long period between the two designs made this evolution unnecessary. Moving beyond play-mechanic design (which, to be honest, would be worth its own in-depth analysis) allows us to, instead, focus on the social and cultural cues that go into the meanings the cards embody. While this was only a brief foray into a storied universe, my hope is that others will attempt the same teasing out of the zeitgeist with other games that have a similar background. Great article, apt connections as always. Thanks for catching my errors! I was writing this up last night, so I’ll blame the caffeine deficiency for this one. I’ll make the corrections, but keep your comment up. Glad you enjoyed the post! You are missing a great opportunity to compare mechanically identical cards: Team Restructuring/Shipment from Kaguya, South African Mining Corp./Melange Mining Corp. . There are several others. That’s a good point. There really is so much to analyze in this game, especially when you factor in the time difference between the releases. How are new ‘effects’ normalized under new social milieus? Is this a repackaging, or is it indicative of social moves towards a new ideal? Thanks for bringing up this point.